Using our extensive experience of developing the toughest skid plates on the planet, the BDCW has now expanded their ULTIMATE protection offering to include BOMBER Lower Engine Bars to provide full coverage to the lower portion of the motorcycle. By attaching DIRECTLY to the FRAME at the FRONT AND REAR of our lower engine bars, these lower engine bars are hell for stout! Utilizing a unique bolt-thru design that passes through the swingarm pivot for the strongest mount possible at the rear, these parts are designed to take a beating. The front portion of the bars are bolted directly to the frame with another unique design that reduces the opportunity for the bars to bend upward in a hard layover. These lower engine bars have been developed to be compatible with the Hepco-Becker Tank Guards—one of the few designs that bolt directly to the frame of the bike at the front. 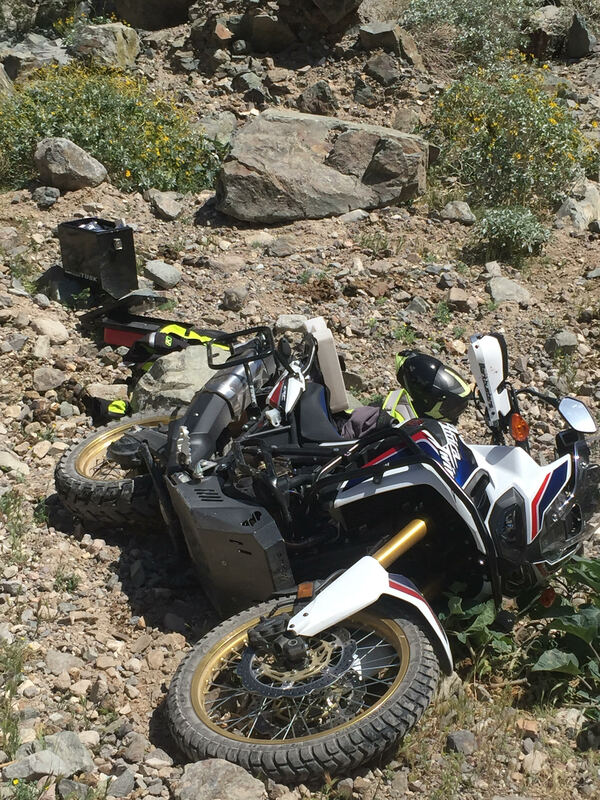 Does not fit the Adventure Sports model with the stock upper "light bar"
Designed to enhance the protection offered by BDCW Ultimate Skid Plate for the Africa Twin. NOT Compatible with the following skid plates: Altrider, SWMotech, Touratech Rallyeform. We do NOT use standoff brackets or connectors which are potential weak spots on the connection points. Unique bolt through design utilizes the hole in the swing arm pivot to link both sides of the bars together—providing the ultimate in strength and durability. No drilling or disassembly required. No disassembly of major components—15 minute install TOPS! Only THREE bolts to remove each side. Stout materials to compliment our stout design. Steel is pre-treated before powder coating is applied to ensure excellent adhesion and durability.